80%of students in The Shadow Project have a positive attitude toward school, compared to 47% prior to our program, according to the 2011 Teacher Survey on Student Impact. Read more about student outcomes. Look for us in the Willamette Week Give!Guide, which will be published in November. More information coming in our next newsletter. We kicked off the new school year with our annual Teacher Orientation, a time for special education teachers to share their powerful strategies for using The Shadow Project to engage struggling students. Teachers also “shopped” at our warehouse for books, school supplies and other educational incentives to help their students achieve goals. This year, The Shadow Project will serve more than 1,200 students in 29 schools. 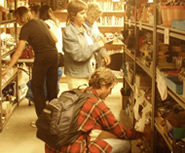 Teachers “shop” at the Shadow warehouse for books, school supplies and more! Read more about kids discovering the joy of reading. 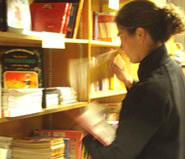 in McMinnville, Jolene says The Shadow Project helps her kids become enthusiastic readers. Last year 75% of her students met or exceeded benchmarks for reading! They’re proud of their accomplishments and invite kids from their mainstream classroom to see just how fun a special ed class can be. A member of The Shadow Project’s giving club, “Friends of Shadow”, Jolene says, “I give because Shadow makes such a powerful difference in my students’ lives.” Grandhaven PTA is also a Friend of Shadow! The Raleigh Hills New Seasons held a Benefit Barbecue for The Shadow Project last month, raising $1,013 to help students with special needs succeed in school. For the second year in a row, The Oregon Public Health Employees chose The Shadow Project as the beneficiary of its annual school supply drive. “These are hard times, but our people really want to support this program,” said coordinator Tamara Burkovskaia. And our old friend, the Newcomers Club of Lake Oswego and West Linn was back with another school supply drive on our behalf. Don’t forget…when you become a Friend of Shadow, your donation doubles. A generous grant from the James F. and Marion L. Miller Foundation matches every new donation of $100 or more dollar for dollar. Click here to go to our donation page.